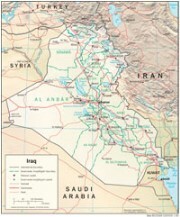 Operation Iraqi Freedom (OIF) took place from 2003 to 2011. The invasion took place in the aftermath of the 9/11 attacks in September 2001. It was suspected that Iraq had weapons of mass destruction (WMD) that it would possibly transfer to terrorist groups and it was suspected that Iraq participated in the some manner in the 9/11 attacks. Proof of WMDs and it's participation in 9/11 is somewhat lacking. In 2011 OIF was renamed Operation New Dawn (OND) - signifying the end to combat operations and the train, advise, and assist phase of the war. Iraq - A Country Study. Library of Congress. Academic Info. Directory of online resources for Iraq studies. War in Iraq. Wikipedia, the free encyclopedia. The Third Persian Gulf War. The History Guy. Six Years in Iraq. A brief history of the war. TIME. Iraq War. History.com. Articles, videos, and facts. The Iraq War Reader: History, Documents, Opinions. Foreign Affairs. Publications on the Post-Iraq War period are listed here. Fontenot, COL Gregory et al, On Point: The United States Army in Operation Iraqi Freedom: Through 1 May 2003, Combat Studies Institute Press, Fort Leavenworth, Kansas., 2004. Wright, Dr. Donald P. and Colonel Timothy R. Reese, On Point II: Transition to the New Campaign - The United States Army in Operation IRAQI FREEDOM May 2003 - January 2005, Combat Studies Institute Press, Fort Leavenworth, Kansas, 2008.